In this spotlight story, a mother shares her young daughters’ frightening experiences with E. coli O157:H7 infections. The family chose to share their story, and the knowledge they gained, to help educate others about health risks associated with drinking raw milk and precautions to take when interacting with farm animals. 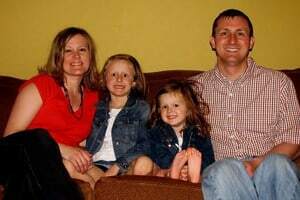 My husband, David, and I have two daughters, Laura (6) and Natalie (3). I grew up in town but my husband grew up on a certified organic dairy farm, which has been in his family for decades. Our daughters visit the farm frequently and when they do they are very hands-on, playing in and around everything, and feeding the animals. We feel blessed that our daughters are able to experience farm life with family. Just prior to their illnesses, the kids stayed with their grandparents while David and I were out of town. While on the farm they helped out with chores and also drank raw milk, just like David and his siblings did when they were kids. Two days after the girls came back from their grandparents’ farm Natalie got sick with cramps and severe diarrhea. We took her to the doctor but we were told that she had “the flu” so her stool was never tested. Six days later, Natalie’s diarrhea and cramping stopped and she’s been doing well ever since. Just as Natalie was getting better Laura became sick with similar symptoms, so I assumed she also had “the flu.” Two days later on May 11th, she started to have blood in her stool. We took Laura to Urgent Care the next day because her bleeding had gotten worse. They examined Laura, took a stool sample, and sent us home with instructions to have Laura see her pediatrician as soon as possible. On Monday, May 13th, we got the test results back that Laura had an E. coli O157:H7 (O157) infection. On May 15th, Laura was at her follow-up appointment with the pediatrician. While there, she went to the bathroom and her urine was brown, which prompted her doctor to immediately order a urine test and blood work. Her urine being brown was an indication that her kidneys weren’t working well. Her doctor wanted her to be seen by pediatric specialists, but there aren’t any near where we live. So, that evening, we headed down to Children’s Hospital in Minneapolis. Nine days after her first symptoms, Laura was diagnosed with hemolytic uremic syndrome (HUS), a serious complication of O157 that means her kidneys had stopped functioning properly. HUS is more likely to happen in young children and can’t be treated with medicine. Instead, while Laura was in the hospital she was monitored through daily blood work and had IV fluids. Thankfully, she did not need a blood transfusion or dialysis, both of which typically are needed for HUS patients. After 5 days in the hospital she went home but continued to have blood work done on a weekly basis for a month. She missed several weeks of school because of fatigue and nausea, but felt well enough to participate in her kindergarten graduation. It took several more weeks to get well, but now she is feeling great. Both girls still enjoy visits to the farm to see their grandma and grandpa. While Laura was hospitalized the Minnesota Department of Health (MDH) was notified of her O157 infection and did an interview with us. We told them Natalie had been sick with similar symptoms but no one had tested her. MDH offered to test Natalie, and that is how we realized that Natalie also had an O157 infection. David and I knew it was possible to get sick from drinking raw milk, but it wasn’t something we really worried about. David grew up drinking raw milk so we didn’t think anything of it when Natalie and Laura began drinking it. Many people think that raw milk is best. I was thinking vitamins, nutrients, and organic- NOT diarrhea, hemorrhaging, and hospitals. Each of us have always been very proactive about hand washing while at the farm, especially before eating or drinking, and after using the bathroom. We are diligent about telling the girls not to touch their eyes, nose, and mouth, especially while outside. You can imagine that this is a hard feat for a 3-year-old! Since the girls got sick, David, I, and the girls have stopped drinking raw milk. Some of our family have had a hard time understanding the dangers of raw milk and continue to drink it, and still make it available to others. David’s parents raised six children on raw milk. It’s confusing for David’s family because none of the children ended up in the hospital like Laura. But I wonder, how many times were David or his siblings sick with the worst “flu” ever but they simply got better? Natalie simply got better. Laura was part of the small and unlucky group of individuals that get HUS from their O157 infection. O157 is naturally found in the intestines of cattle, sheep, and goats but doesn’t make them sick. People get sick when they swallow the bacteria by drinking raw milk, eating other contaminated foods, or from hand-to-mouth contact after touching an animal or its environment. Don’t drink raw milk, even if there are influences that try to persuade you otherwise. We choose to take ownership of our health and beliefs and we feel more confident about that every day. Even though this was a frightening experience for all of us, we are thankful for the knowledge it has given us. Editor’s Note: There is no such thing as the “stomach flu” (frequently shortened to “flu”). Instead, this phrase is commonly used as a catch-all for illness that involves vomiting, diarrhea, and aches. There are many types of germs that cause these symptoms, including E. coli O157:H7. Laura is a lucky kid–about 5% of HUS cases are fatal. In addition, she did not require blood transfusions or dialysis, which is unusual for an HUS case. Still, HUS can lead to life-long health effects. In this instance, the cattle were undoubtedly the ultimate source of the bacteria that made Laura sick whether it be through direct contact with the cattle, drinking raw cow’s milk, or even if her sister was the one who gave her the infection. E. coli O157:H7 is present in the vast majority of cattle herds. The bacteria are carried in the intestine of cattle and are passed in cattle feces. One of the most common arguments we hear from raw milk drinkers is “we have always drank raw milk and we are fine.” As Laura’s mother indicated, Laura’s father grew up on a dairy farm drinking raw milk; however, when David was growing up it wasn’t nearly as common to find E. coli O157:H7 in cattle, which are the natural “reservoir” or source, along with other ruminant animals such as goats and sheep. In fact, E. coli O157:H7 was first “discovered” in the early 1980’s. E. coli O157:H7 is a much bigger public health concern in raw milk and from animal contact now than it was 30 years ago. 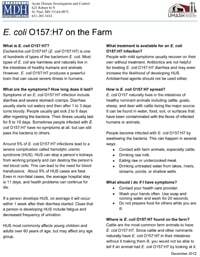 We see this process play out frequently in the form of E. coli O157:H7 (and other germ) infections in farm children, usually under the age of 6 years. By 6 years of age, many (but certainly not all) farm kids have been infected and thus developed immunity to germs found on the farm. The problem is that in some children these infections can be severe. 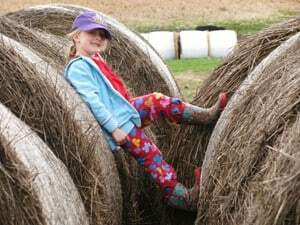 In contrast to farm children, most people who visit farms are continuously at risk, even when they are older, because they are not exposed to these germs on an on-going basis and thus are much less likely to develop immunity. Many thanks to the family for so willingly participating in the UMASH investigation and sharing their story so that others can learn from their harrowing experience. For more information about raw milk please visit: www.realrawmilkfacts.com.